Making music using only iOS devices & Apps. Unbiased reviews from the unique perspective of an artist using them. Say NO To Wires. 3 Incredible special effects apps combine to astound us! Big tough words right? Well, I’m serious. I’ve had some time to really sit and dig in to 3 relatively new effects apps from 3 of my favorite developers. Time enough to discover that there’s not enough time to discover it all. Individually, each is simply marvelous in their own right, but combine them and you have a massively exciting audio trilogy of sound effects goodness. These incredible effects apps each have uniquely outstanding qualities that by themselves would be fantastically satisfying and hugely time consuming. Plenty of joy will come from each one, offering loads of creative experiences. It’s when they are placed together, working in harmony through Audiobus, that they stand together like a trio of god-like rock star band mates ruling the heavens of audio special effects. Special effects gone totally bananas. Choose your Input > Effects > route and run them all into your favorite iDAW (or Output) app to capture the sonic sundae. 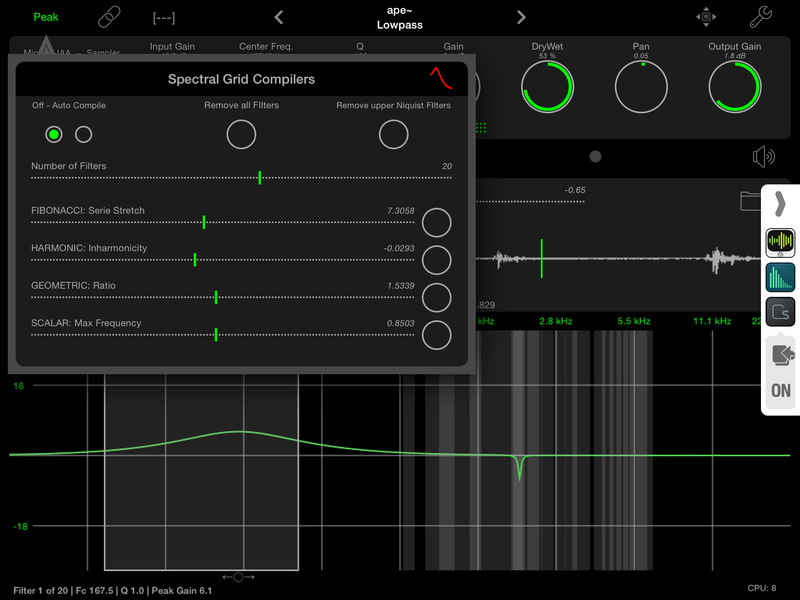 Typically I use AltiSpace in the middle, between aprFilter and then csSpectral, however this combo is not only excellent but also demanding on your device. I’d not recommend anything less than iPad 4 and preferably iPad Air. Depending on your device and needs, 512 latency should be fine. I load up my sample with apeFilter and make initial filtering adjustments. apeFilter has excellent sample and frequency control both backward and forward which can be manipulated in real time, any time. 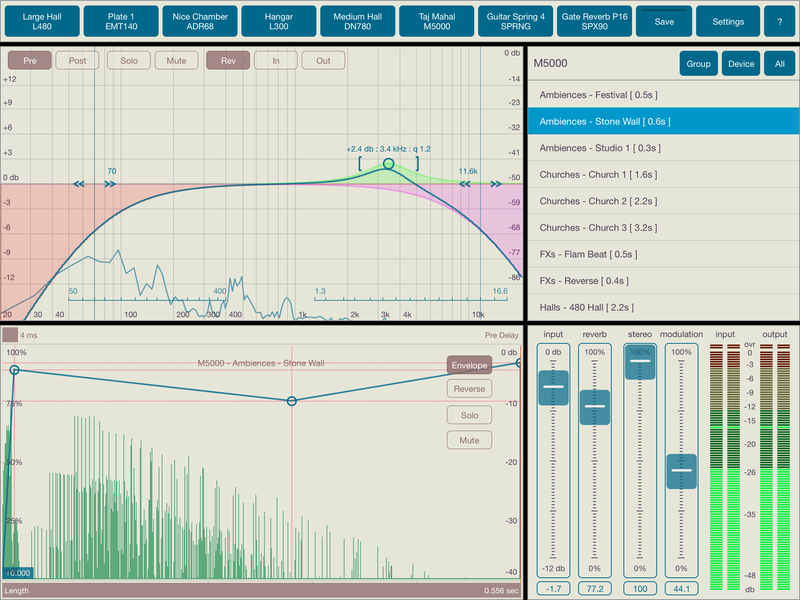 The interactive GUI is perfect for controlling up to 36 peaks filters frequencies. Packed with high quality common filters (Lo/Hi and band pass, notch, and Hi or Lo shelf) and some post effects like delay and compression apeFilter is perfect for shaping your samples. Don’t forget the spectral grid where you can finger paint your way through the pitch space using the 4 compilers. Try it out and you’ll see. Next I have AltiSpace Convolution Reverb in the effects part of the chain. 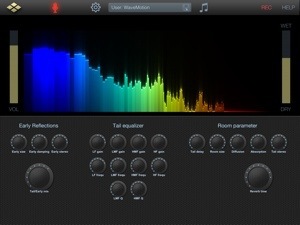 This is the first stand alone convolution reverb unit for iOS. In case you’re wondering what a convolution reverb is, it is a form of reconstructing the reverb effect of other reverb effects units. Taken from actual impulse response recordings or real world acoustical reverberations emulated digitally. It’s a lot of complicated math I won’t pretend to understand, it’s just really good. 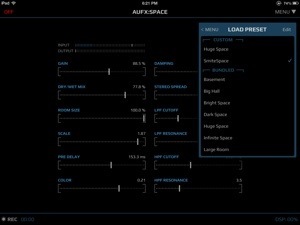 AltiSpace recreates some of the best reverb units made. Something you might notice that’s very different from algorithmic reverbs is the convolution reverb doesn’t have all those parameter controls you might be used to. Controls like tail, width, and swirl etc. Instead of tweaking various parameters, you just select a different IR or impulse response. With 250 loaded IRs there’s no shortage. Plus you still have basic parameter controls including some EQing and a super cool reverse option. I love the reverse part. In the last or output spot I use csSpectral. 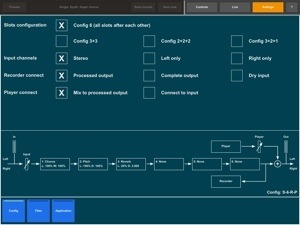 A Csound based multi effect processor. This thing is amazing. 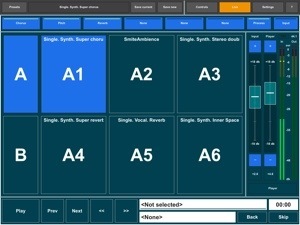 Nearly every parameter of each effects unit can be randomized and automated. There are 7 FFT (fast Fourier transform) based algorithmic spectral types. 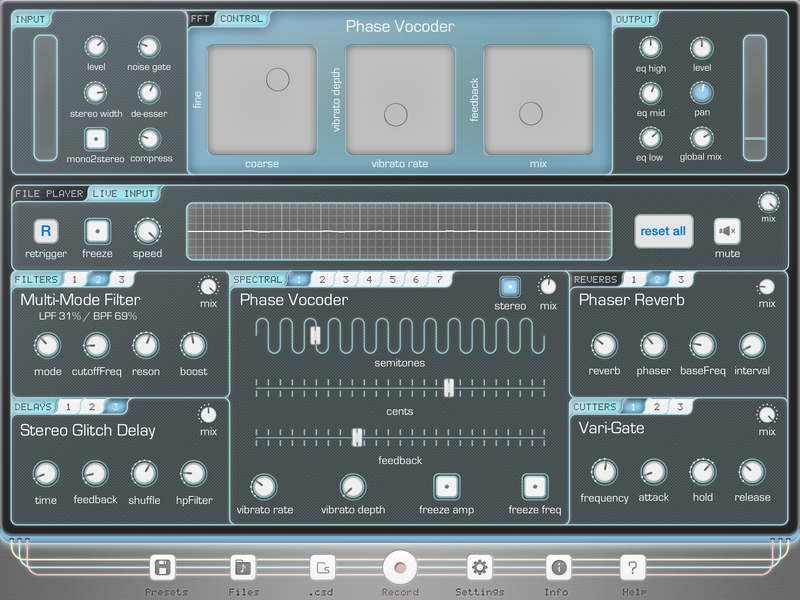 Including a Phase Vocoder, spectral blur, spectral re-synthesizer and more. There so much you can do with any one of these and you’re still only just getting started with this app. The 12 total variations of the DSP effects bring a truck load of sound effects goodness to the table. Basically there’s 3 variants each of the 4 effects units. Multi-Mode Filter, Stereo Glitch Delay, Micro Cutter, Phaser Reverb, Modal Resonator, LoFi Delay, Bouncer (Cutter), Ball In The Box Reverb and more. Each have something special to offer. csSpectral is a big scary beast. It’s just too much fun to play with sound in this. Recording and editing the resulting samples are a cinch. There is no rule you need to follow here. Like I said each app stands alone with its own greatness. I just happen to think altogether they make an impressive team. It’s all going to be in how you use them, but the capability is there. Only the users themselves are responsible if they end up having a disappointing experience. iMusicAlbum has recently been offering quality audio processing options for iOS music production that are highly convenient for many uses. 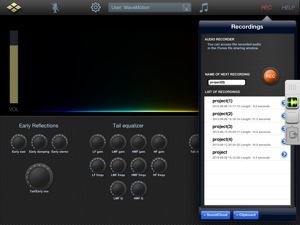 Their latest is this live audio multi-effects app for external sources such as vocals, instruments etc. 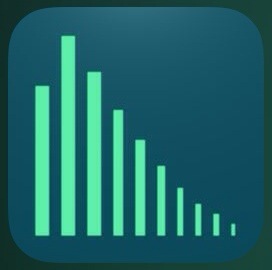 Additionally it can be used in the Audiobus effect and output slots, making this a very versatile app. 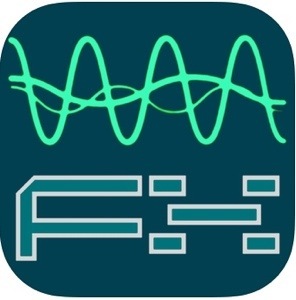 Primarily Master FX is intended for use with guitars, vocals, or any other instruments that can be adapted to your device where the app will process desired effects. 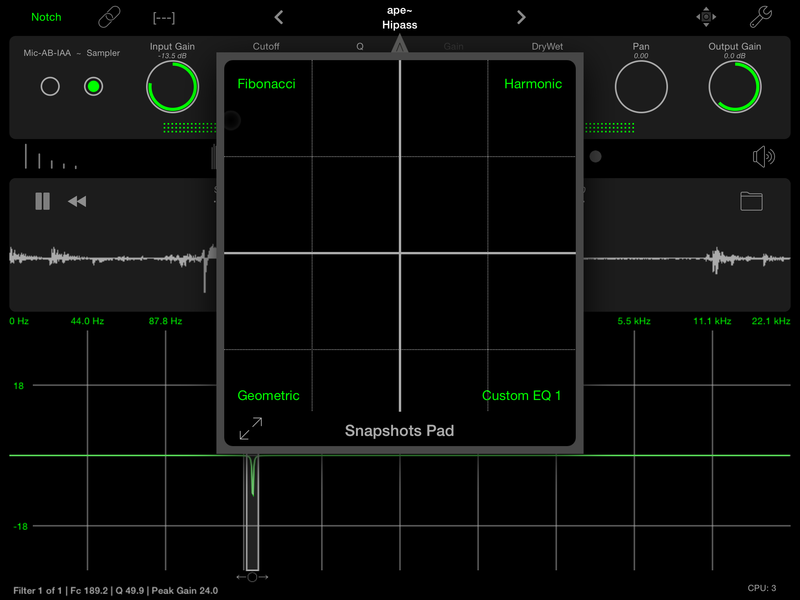 Recording can be done within the app itself as well as your favorite iDAW. Sadly, at least at the moment I am writing this, Master FX does not support inter-app audio. This means if you use Audiobus to facilitate recordings of external instrumentation that you are only able to record 16 bit audio. Otherwise apart from that this can record at 24 bits. For electronic music 16 bits is just fine, but for live vocals or guitars it is less desirable. 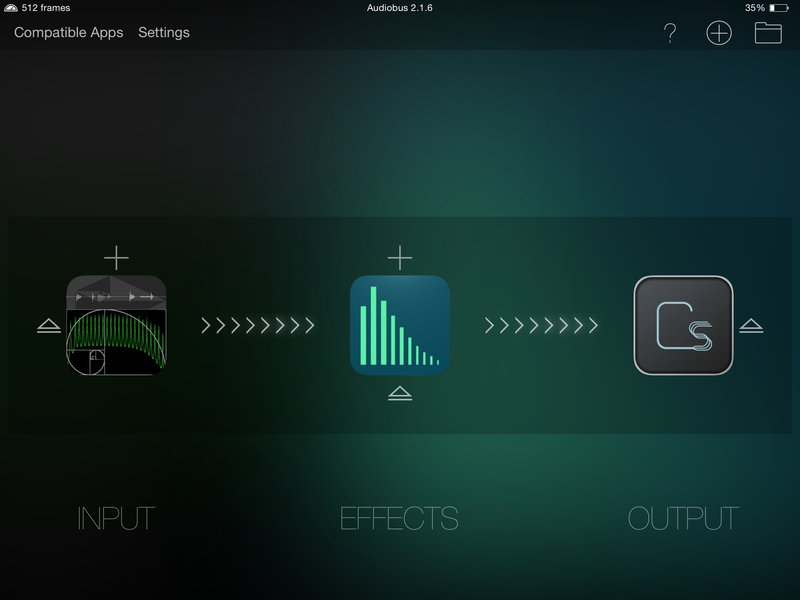 Master FX comes with 7 effects modules and limiter at the main output. 6 effects can be run simultaneously. The built in effects are: Chorus, Reverb, Delay, Compressor, Flanger, Pitch, and a 3 band Parametric EQ. The order of each module can be customized to fit whatever preferences you may have for the signal order. Furthermore, two assignable pad banks (6 each, A&B) can accommodate your presets for quick FX switching via the “Live” tab. Add to that independent “left/right” channel recording to capture a guitar and vocals at the same time. The effects are not simply just wet/dry sliders, but actual independent modules. This means by selecting the module tab the corresponding effect unit opens up full screen to present you with all of its adjustable parameters. They are still not exactly “specialized” effects such as what you would find in a stand alone effects app (like Audio Reverb, EchoPad etc) but they are each quite good in their own right. For live situations they are especially handy being all in one app, on one screen. Several carefully crafted presets are included for certain and specific scenarios or instruments in mind. You can also create and save your own preset banks. Recording can be done directly to Master FX, and files are easily managed. If you’ve used any of iMusicAlbum’s other apps like the excellent “AudioMastering” app, you will feel right at home with the same style of file manager. Not to mention the whole design of Master FX is also designed with the same uniform interface as this developer’s other audio apps. Managing files in the app is one thing but moving files around needs to be easy too. Anybody familiar with iOS Music production knows that moving files around between our various other apps or cloud services is a must. No problem. Master FX has the bases covered with Dropbox, AudioCopy/Paste, iTunes Playlist & File Share, “Open In” and WiFi tools for importing and exporting with ease. I’ve been testing Master FX mostly as it’s intended, by recording and processing audio captured with my iRigMic. I found no issues or problems at all. Even though iRigMic is mono, Master FX, with the right selection of modules and signal path set, did a great job of giving my recordings body and fullness that resembled a stereo recording with no discernible difference. 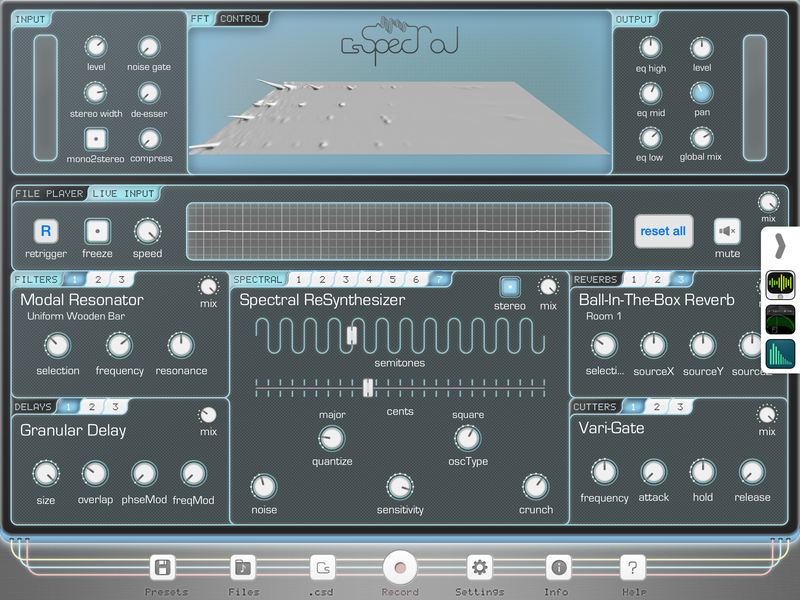 I also tried it as an “Effect” slot in Audiobus and had just as good of an experience. For an all in one multi FX app, Master FX does a fine job in each of its possible situational applications. Stable, easy to use and understand it should make for a top choice. My only gripe is that it doesn’t currently support inter-app audio, and the Reverb and Chorus could be a little bit better. Nothing bad, they are decent, I just feel they are not this app’s strong point. This is more of a “student of many” rather than a master of anything in particular. If you’re looking for a particular, highly specialized effect type this probably shouldn’t be the first choice. 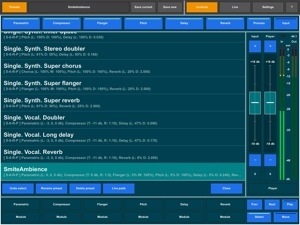 However if you want a collection of good effects to use simultaneously and packaged neatly in one app for live uses with real world instruments or vocals, then this is a list topper. 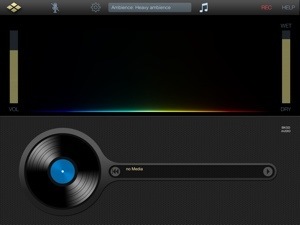 Check out the tutorial on iMusicAlbum’s website (linked midway and top) for the two channel recording. Many of you should find it particularly interesting. 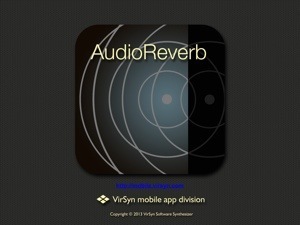 VirSyn is no newcomer to high quality music software development, yet I was still caught by surprise when I saw they released a new stand alone Reverb effects app. Interesting timing. We just saw two others very recently. Audio Reverb is very different. Most reverbs are algorithmic types that emulate various spaces and whatnot. In this case we have an Impulse Response type that is from real recordings of natural acoustic reverberations. Additionally classical algorithms are included to recreate their acoustical properties. The combination makes for some of the most amazing and most natural-sounding reverberation effects. This is currently the very best sounding of the stand alone reverb app types. Audio Reverb is packed with a well designed collection of the most important adjustable parameters allowing massive design potential. VirSyn understands the importance of “Early Reflection” and full user control. Our ears perceive these early reflections and basically translate to our brain what sort of room is being heard. Is it big or small, or made of wood or concrete etc. From those room sizes, and how frequencies are absorbed, to even discerning the materials in the walls of said rooms. This is pretty dang important and if done right (as I believe VirSyn has here) is what separates good from great to the spectacular Reverb units. How you adjust the “Early Reflection” parameters will have a big effect on the overall sound being recreated, and with much variety. It can be complex stuff, and even subtle adjustments can impact what’s heard. With the quality of this app’s design, there are numerous possibilities to stumble upon, or seek out specifically. As complex as this is, don’t sweat it this app has hundreds of very carefully crafted presets to suit most any need ready for you. In addition to thoughtful attention to early reflection parameter details, Audio Reverb also contains a sophisticated Tail Equalizer. The “Tail Equalizer” controls frequencies contained in the early reflections and the reverberation tail. This is where you set “color” or “temperature” to a room. It does not filter the direct signal. With the Hi/Lo shelving filters, and the LoMid & HiMid frequency peaking filters, including gain and resonance controls you can have any “color” or “temperature” you like. These types of filters are relatively common among reverb units, but there is something special about what VirSyn has given us in this app. It makes a difference you can really hear. 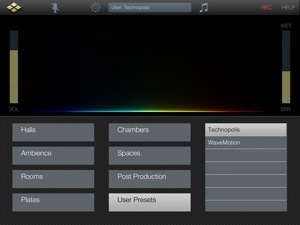 It all comes together and becomes cohesive with the “Room Parameter” section of controls. Often other iOS reverbs ignore things found in this section. In order to define the reverberation effect best, a well made selection of parameters to basically recreate a room or space is needed. Tail Delay is directly related to the room size being simulated. Room Size essentially moves the walls of the room in or outward. Setting the distance between the walls. The Diffusion parameter controls the density of echos from the reverberated sound and the adjustable range is very effective. The higher the setting, the more dense the echo is, and will lend to a more natural sound. The often forgotten Absorption parameter is very welcome. It simulates the surface and air absorption of high frequencies. More absorption affects high frequencies making them shorter than low frequencies. A higher sound will die out faster as this is increased. Tail Stereo and Reverb Time set the tail stereo width, and the overall length of decay from the initial sound entering the simulated room. An astonishing 100 seconds is the maximum time setting. Sometimes its like the sound just keeps going on and on further and further away. It doesn’t just end (unless you want it to and set a short time) or suddenly peter out in a coarse halt. Its super smooth, and natural. It is as if the sound continues infinitely beyond what you can hear. It’s a quality that adds a feeling of the sound being timeless, figuratively speaking. Really this sounds the most natural of all stand alone reverb options by a wide margin. Audio Reverb is of course Audiobus supported at the FX and Output slots. You can record directly to the app through your device mic or iRig Mic (any compatible mic), and is also complete with AudioCopy/Paste. iTunes File Share (Just being a little sarcastic)is also supported for some reason. Furthermore recordings can be uploaded straight to your SoundCloud. Another cool feature of Audio Reverb is you can play your own music from your iTunes Library. Add some reverb effect to any song. Try Pink Floyd’s “GoodBye Blue Sky” with a cathedral setting. Nice! After spending a solid amount of time with this and all other iOS reverbs, and testing extensively, I have found Audio Reverb to have the very best sound quality overall. It is flexible, reliable, and has no strange anomalies. This is exactly the kind of reverb we’ve been missing. It’s better than Auria’s Classic Reverb Pro by miles. The added waveform graphic is not just colorful and appealing, but useful for a visual queue of what’s going on with the sound. Instead of sounding like an effect laying on top of the sound (which of course is exactly what is happening), it seamlessly blends with it as if it were always a part of it. That’s the good stuff! As great as this is, there’s some pretty big things missing. 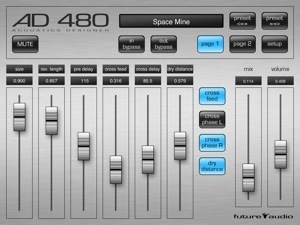 Notably there is no MIDI integration to be found as seen in the likes of AD480 Pro or AUFX:Space. That may present a problem to some. On the other hand if like me, you’re focused more on audio and using this through Audiobus, then no problem. Another missing feature that I was really hoping to find upon first opening this app was no chorus or swirl type modulation. Maybe I am asking for too much, but I’d love to see something added at some point. It could also benefit from a email option to share user presets. Its been very stable in all my tests with iPads 3 & 4 through Audiobus, and with other demanding synth apps. This is a powerful reverb that doesn’t get in your face demanding power. I’m sure there is a way to over do it, but in regular to heavy use its not been a problem for me. If you want a big, natural sounding reverb, don’t mind the lack of MIDI, and have $10 then you should probably get this. I wish I had Audio Reverb a couple years ago. They said you can’t get a high quality reverb on iOS. They said you can’t do a lot of things with iOS. They were right to some extent, but that was a while ago. Now of course a very large number of high quality tools & options exist for making professional quality music productions. iOS Reverb options had been difficult to defend and honestly refer to as “professional” or “high quality” for a while. With increased device power (still relatively underpowered) and evolving development, the past several months have seen a boom in high powered music apps of all sorts. 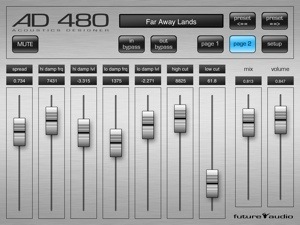 Now AD480 Pro has come along to offer us a very nice quality stand alone reverb app. This is not your Grandmas “FreeVerb”. You probably know by now that I love Reverb. If you didn’t, well, now you do. Reverb is a powerful effect giving most any sound a boost in warmth, depth, and wideness. Its very useful, and found nearly everywhere in music. It is a power hungry effect. Which is why early iOS music apps could never really deliver a high quality option. There was even a time when professionals would laugh at the idea of a digital reverb emulation ever being possible. Of course computers have rapidly moved forward and had numerous digital Reverb options at a very high quality standard for years. iOS however is just beginning to join the party. AD480 Pro is the first high end, stand alone reverb app to hit the App Store, but not the very first high quality or professional reverb option (See my Auria – Plug Ins & FX review series) available to iOS musicians. But, this is about stand alone FX apps, so I’ll stay on track. This really does sound amazing! 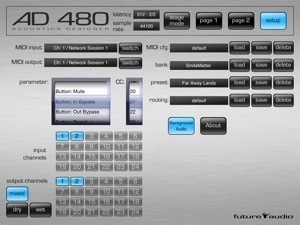 AD480 Pro is a unique algorithm created by Future Audio, inspired by legendary reverb units such as “Lexicon” and the likes. They wanted to develop a reverb that can reproduce any acoustic space imaginable. Furthermore they wanted to make it easy to use with a bevy of adjustable parameters and routing options for the user to manipulate to their liking. I think they were successful on all counts with AD480 Pro. 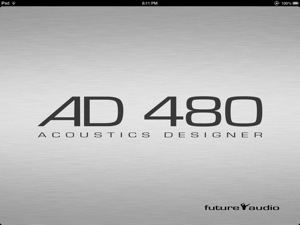 AD480 Pro has a great sound. A really great sound! 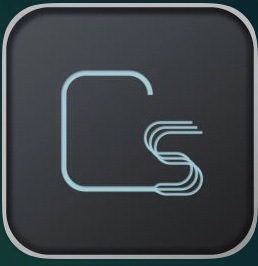 It is fully Audiobus compatible supporting “Input”, “Effects” and “Output” slots. It is easy to use in any situation such as playing live, in the studio, a park or practically anywhere. There’s no shortage of possibilities to create a wide margin of reverberation effects. Having control over Hi/Lo filter frequencies, levels, dampness, cutoffs, spread, mix, and many more parameters will offer you a multitude of sound types. With 108 presets covering a wide spectrum of sounds, there’s plenty of stuff ready to go and or build off of. Create and save your own patches and banks for easy use another time. The cross feed parameters have a powerful effect, but may not always be necessary. I had been experimenting with these and hearing some added metallic sounds I wanted no part of. That was a helpful explanation. It made so much sense to me that I felt silly asking the question. It goes to show you that they are very proud of AD480 Pro and eager to help. 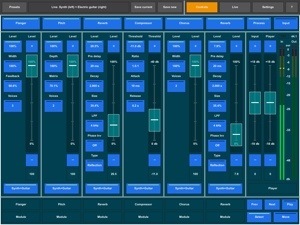 24 input and output channel routing matrix. Internal/ external USB class compliant audio interfaces supported. Full MIDI communication support via network, & USB-MIDI & internal (virtual) MIDI. Super low latency from 64 samples up. Low Light Mode – Looks pretty cool by the way. 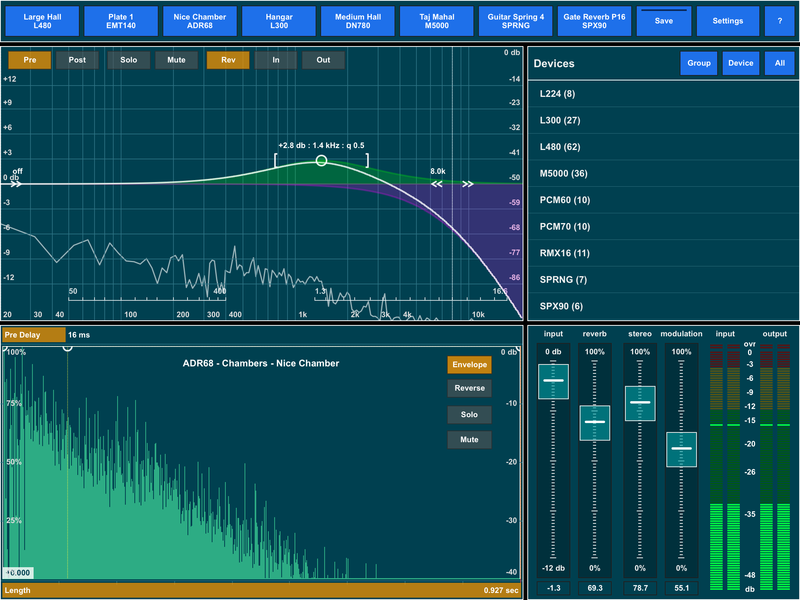 There are plenty of functions and parameters available to explore the world of reverb. Nothing fancy like modulations, tuning, or springs etc, but plenty to make excellent sounding reverb space effects. Space, as in a space like a room, not deep space. You can however create deep space reverb sound effects though. Imagine a star destroyers massive hanger bay after all the fighters departed. Vast! It can be done as big or small, cold or warm as you want. I had no instances where I felt I was unable to achieve the sound I was looking for. When I wanted a warm feel or a deep space chill, it was no problem. I never felt like I was using some old cheap sounding FreeVerb algorithm. What I’ve been hearing from AD480 Pro has been very satisfying and truly professional sounding. I’ve not experienced any crashing even when using Audiobus with this, an input and an output app. Its been stable on both my iPads 3&4. My only complaints are there’s no recording function, & no AudioCopy/Paste. That dings the convenience factor in my opinion. My other stand alone reverb app is much better for recording directly into it, and or importing and exporting samples between other apps without having to rely on Audiobus or bounce around from app to app. I was also a little disappointed in the lack of a chorus or other modulation parameters considering the price. Some modulation options might be added, and more presets at a later time, but as IAPs. I get the IAP for modulation, but for presets? The following in this paragraph alone has been edited with additional content Maybe its because I do my own sound design, and find the parameters of this app to be pretty strait forward, but selling presets in this case just seems silly to me. Just my opinion. Maybe its a great idea to offer professionally designed presets via IAP? Could it be a good value for folks who either don’t feel comfortable trying to make their own, or just don’t want to spend the time? What do you think? Leave a comment, Id love to hear your thoughts, and I think the developer might appreciate it as well? Minor gripes aside, its about the quality of the app and AD480 Pro oozes quality. Considering that a comparable desktop plug in would cost many times more than this, AD480 is a good value. Just a little inconvenient in certain situations. Reverb is one of those FX that is found almost everywhere. It’s used in so many settings. From ambient electronic to heavy metal, reverb is in most any music. It’s not just an effect for music, but also something that occurs naturally in seemingly mundane places. Basements, cathedrals, auditoriums, arenas, and caves to name a few. It is often equated to vast space. Sometimes outer space, which is ironic as sound doesn’t carry in a vacuum. Sure that’s not literal when referring to reverb in terms of space with stars and planets, but it does represent the vastness that reverb can convey. So “Space” is a good descriptive word when we are talking about reverb. 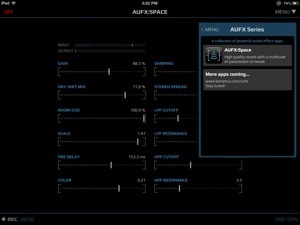 AUFX: Space, is the latest and the first in a series of effects units being developed by Kymatica. You may know of Kymatica from their other highly useful and quality apps like “AudioShare” “BitWiz” and “Gestrument” among others. What the rest of the AUFX series turns out to include remains to be seen, but “Space” is a great start. Reverb and iOS have not had a long running record of high quality offerings. “Space” aims to change that going forward. Finally a stand alone high quality reverb app is here. 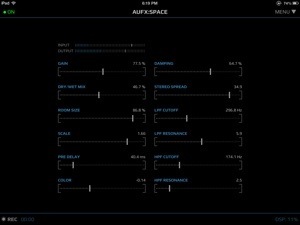 AUFX: Space is a high quality 32 bit DSP reverb unit with enough adjustable parameters to shape or mimic countless reverb types superbly. All the standard reverb parameters plus a few more are built in to Space. Spread, Damping, Pre-Delay, Wet/Dry, Scale, Gain, Room Size, Color, and both LoPass and HiPass resonant filters with Cutoff. Very nearly complete. 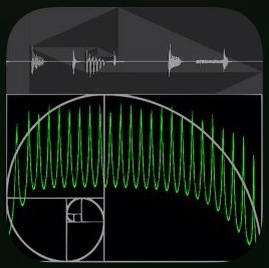 I say nearly because it’s missing a parameter I’ve been seeking for ages in iOS reverbs; “Swirl” or “Chorus” of sorts. Not like a full-on Chorus effect, which I suspect will be offered later in the AUFX series, but a kind that adds a dimension of movement with the reverberations. Maybe it’ll come, but it’s a lot to ask for since it would add more power demands to an already efficient app. No need to over do it, but it would be nice to see for once. The numerous highly adjustable parameters I listed from Space have allowed me to make some fantastic-sounding effects that nothing (Aurias Reverb Plug Ins are the exception) in iOS has allowed before. Space scratches the reverb itch. Deep, rich, warm, and expansive to short, cold, subtle and every effect in-between sound really nice. Unlike most iOS reverb options, which by comparison to “Space” sound very thin, cheap, and like they’re coming from within tin cans. They have been improving slowly, but this is a significant and targeted advancement. AUFX: Space fills a void (no pun intended) I thought might never be filled. I wish I had this 2 years ago. 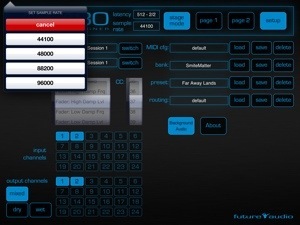 Process hardware input/output or other apps through Audiobus (input/filter/output slots supported). Ready for the future inter-app audio standard. Fully MIDI controllable, including Virtual MIDI. Save and load user presets. Comes with several bundled presets. Record the result directly in app. Email recordings or export to AudioShare audio document manager app. Access user presets and recordings through iTunes File Sharing. Using this app with Audiobus has proven to be problem free so far as I’ve experienced on my iPads 3 and 4. In case “clipping” were to happen there is a thoughtful “limiter” function which can be enabled from the menu. It says it adds 10MS to latency, but I haven’t noticed it. You can also save your concoctions to call up later easily from the menu. The U.I. is simple and uncluttered making usage effortless. Its just you and Space with nothing distracting. The way it should be. With the ability to record directly, run through all Audiobus slots, and MIDI including virtual MIDI, its ready for any project. Not to mention its already built with iOS 7s “inter-app audio” standard in mind and prepared for when iOS7 releases. When this releases (could be sometime in July) I would encourage anyone who wants a simple yet sophisticated and excellent reverb option to pick this up. I wanted to add that I have been using “Space” with my iRig Mic to capture audio recording directly to the app. It was not only convenient, but really sounded great even through the iRig. Just holding on the recording from the menu brings up a option to quickly move files to AudioShare. The launch price of $3.99 is a steal! Low price compared to others, but by no means is this cheap. Sure you could go spend $10 $20 or more for other stand alone FX, but you won’t get anything better than this. 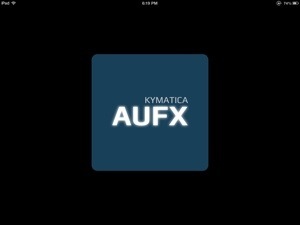 It will be very interesting to see what Kymatica offers next in the AUFX apps series. I for one am very eager to find out. At any rate, this is a really great start! 2nd Anniversary Re-Issue Of Technopolis Lost A special 2nd anniversary re-issue of my first album “Technopolis Lost” with a new cover, and previously unreleased bonus track. SmiteMatter On BandCamp Here you will find my music for purchase & download. Also available in iTunes, and listen free on Spotify. Thank you for coming by. Take your wires off, stay a while. Read some reviews, or my random thoughts on iOS music in general. Is there something you want to know? Anything you’d like to ask? Well, I encourage you to go right on ahead and let me know. Leave a comment if you wish, or email me if you prefer. Your support is greatly appreciated, and since I do not ask for donations, you can show some support by purchasing any of the music I have released. From a single track for a buck, to my full albums “Technopolis Lost” or “Chapters” from most any online digital music retailer like BandCamp, CDBaby, iTunes etc. ON SOUNDCLOUD, SPOTIFY, LASTFM, JANGO, RDIO, RHAPSODY, etc. ON YOUTUBE- I have a YouTube, but haven’t used it much as I am not a skilled video producer. I dabble though & I did ( then redid, the whole thing ) recently make a slide show/music video for my song: “A View Of Secrets”. ONLINE MUSIC RETAILERS- My music is available at most online digital retailers. Such as: iTunes, Amazon.com, eMusic, CDBaby.com and many more. I am a recording artist and independent blogger who writes about my experiences with iOS music and the applications I use. Much of what you will find on my blog are reviews of music apps. I do not sell advertising. I do not now, nor have I ever used “Affiliates”, such as “LinkShare” or any others. Links I do provide are purely for convenience to the reader and of no benefit to me. I receive no monetary compensation, nor percentage of any music app ever sold. I do not have a donation option. However your financial support helps put food on the table, keep a roof over my families heads, and the lights on. If you do appreciate my efforts you can do so by purchasing my music from any online digital retailer. It is greatly appreciated. Check the “More great sites about iOS music” in the links section on this sidebar leading to my released music. Whether I receive an app that I review by a promo code from the developer, from a beta build I help with testing, or purchase myself; ALL of my reviews are unbiased, honest, and true. I personally guarantee my reviews to be completely honest and based solely on my own opinion and experiences with zero obligation to any outside influences. I only review apps I can and or would use. If I don’t like, can’t use, or wouldn’t use any music app, I don’t write about it. The primary reason for that is to make the best use of my time and provide you a solid collection of reviews for the best music apps I would recommend and not waste our time with negative posts. My policy for what I will review is simple. I will review iOS music applications I would or could use in my music productions. Because I make my music using iOS devices and music apps, they must now currently have AudioCopy/Paste, and support for Audiobus and/or Inter-App Audio (IAA) or at the very least AUv3. Say NO to wires! Say yes to being as creative as possible wherever you are.